Meaning 'of the people', Kabantu is an eclectic five-piece who unravel new marriages of music from around the globe. 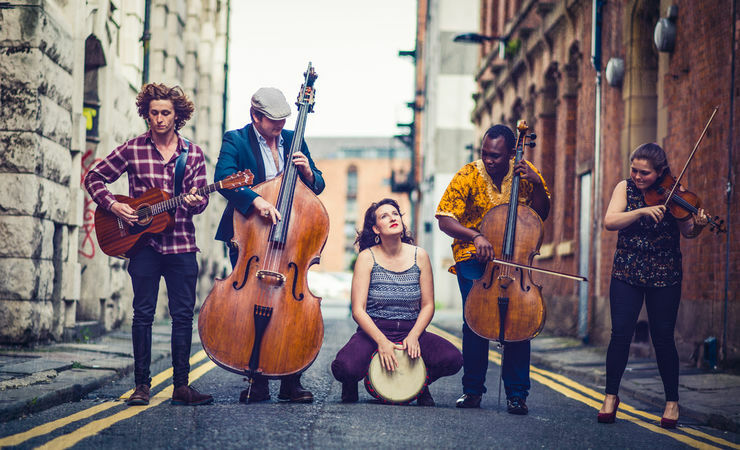 Hailing originally from Manchester, this vibrant young band blend vocal harmonies from South Africa with everything from Celtic reels and Balkan folk music to Brazilian samba and beyond. Kabantu have performed all over the UK including at the Royal Albert Hall, Sage Gateshead and Cadogan Hall, and have appeared at the BBC Proms, Celtic Connections and the Cambridge Folk Festival. In 2018 Kabantu release their debut album 'Of the People' to critical acclaim, recorded by the Mercury-nominated producer Gerry Diver. Using music to bridge countries and cultures, Kabantu create upliftingly exuberant and joyful performances. "a global experimentalism that is both breathtaking and very refreshing"